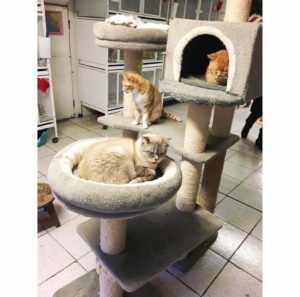 Experience has taught us and funds allow us now to give all our cats the best possible care. 3. All are tested for FIV and FeLV. If a cat is positive for FeLV, we cannot accept the cat in the shelter. The disease is transmitted by body fluids; sneezing, grooming, litter boxes and food bowls are ways to transmit FeLV to healthy cats. We will do our best to home these unfortunate FeLV + cats. We do accept healthy FIV cats in our shelter: once sterilized, they do not pose a threat to the healthy cats. Once cats have been vaccinated and tested, they are spayed and neutered. When they have recovered from surgery, they are released from their cages to adapt to their new surroundings, first in the nursery and when the vet staff considers them ready, they are allowed to be free in the shelter. The advantages: ​surgery is minor and recovery faster plus kittens do not have to be in a cage for a long period awaiting sterilization (we cannot risk having unsterilized kittens free in the shelter!) and are ready to be adopted sooner. The foster program has contributed much to the health of our kittens. Since they have an immature immune system, their health and even their lives are at risk in the shelter. The death rate among kittens in TA has dropped dramatically since we started the Foster Program. Besides being healthier, kittens are socialized better and faster, which improves their chances for an adoption.